A fish fillet is one of the most nutritious dishes you can prepare anywhere with ease and versatility. The techniques to fillet any fish to perfection is an acquired skill that is determined by the type of fish, methods used and most importantly, the knife used. Filleting your fish on your own is something that most cooks and sous-chefs recommend for better quality and lower price, especially when you are like to eat fish fillet on a regular basis. The technique is mastered in time but selecting the right knife is the most crucial step in presenting a boneless and clean fish on the menu. The Cuda Fillet Knife is a product of the trusted Cuda brand that specializes in kitchen and domestic tools used by anglers. Many users have recommended the barracuda-shape inspired fillet knife as one of the most sought-after brands and line of fillet knives. Rated as an average between 3 to 5 stars, this knife from the powerful, precise and robust brand got our attention. 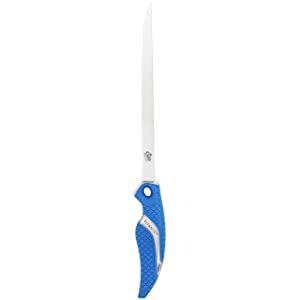 Made from bonded alloy and titanium, Cuda Fillet Knife is perfected to cut fresh water and salt water fish with finesse. The Cuda Titanium knife features flexible blades and precision edge with Cuda scale pattern handle for better grip. To determine if the Cuda Titanium Fillet knife is for you or not, let us first examine all the features that the titanium bonded flex fillet knife has to offer. Titanium is one of most resilient metals, and when it is blended with stainless steel, it provides a solid structure that adds durability and reliability. It can be sharpened with a wet stone or burr with other knife sharpeners without much effort. The titanium bond will also make it rust resistant and preserve the sharpness of the blade longer so that you can use it easily every day to cut through hard meat or delicate skin. The titanium bonded blades are resistant to peel, chip, flake, and blister and it also makes studier than most other steel bonded knives. A full tang means that the fillet knife is one solid piece and the handle pieces are pinned on the blade on each side which makes it the most stable tang types. The Cuda fillet knife also features a full that that extends through the handle of the knife making it sturdy and reliable while cutting through tough meat. It also gives more support and rigidity to the handle, making it useful for filleting big and small fish. Handling fish can be tough to grip because of the slippery scale that all aquatic creatures have. The fluid that exits from the fish while cutting it often transfers on the hands, making it harder to grip something firmly. With the Cuda scale grip design on the handle of the fillet knife, you can comfortably hold on to the blade with a secure grip. When you can grip the handle comfortably, it makes it easier to control your slits and cuts. The trademark Cuda scale design of the brand is finished with an attractive matte blue color that blends well with the titanium and steel accent. Unlike other knives made from regular steel and alloys, the Cuda Flex Fillet knife is constructed with the German 4116 stainless steel with a combination of chromium and carbon which we know are two of the hardest elements. This unique combination of stainless steel and tough ores prevent corrosion, adds strength and retains edge sharpness. What adds to the sturdiness and specialty of the conventional looking fillet knife is the construction of the blade. A high technological process was incorporated to create the smooth finishing that allows you to cut the fish with ease and uniformity. The edge is then “passivated” with chromium oxide that prevents it from corroding due to salt water. Finally, the exterior surface is titanium bonded to harden the body further. Even though the construction of the knife is made of the hardest elements, it still retains the flexibility of an efficient fillet knife that requires the blade to be angled with the fish. The balance flexibility makes it easier to slide the knife down the backbone while removing the skin. With those features in details, let us summarise the benefits and disadvantages of the Cuda Titanium Fillet Knife. It has a consistent burr from the tip to the handle which makes cutting fish smooth and less messy. With those examinations, it would be safe to say that the Cuba 9’’ Fillet Knife does come with all the expected features of a professional fillet knife. The flexibility and the size of the handle highly vary on the user, so that does not reduce its quality. With its current price, it does offer attractive features, and it would make an ideal fillet knife if you are not fussy about the flexibility.